Just recently I received an email from someone asking for advise on how to create closet space when the ceiling is sloped or slanted. I understand this problem, and know that many of us have the same dilemma. So, I wanted to expand on my other articles of small closets and drool worthy closets by adding this article on sloped ceiling closets. To begin with, you should first know that any ceiling can work with a closet if the design is thought through thoroughly. But just as in this example above, you should keep in mind that a sloped ceiling closet will more than likely require more floor square footage than a traditional ceiling. The reason is because you have to expand out away from the wall in order to get the height. But there are ways to put this to your benefit. For example, (above) instead of having a toe kick install a drawer below. You may as well. The depth will be quite good, and it would be wasted space otherwise. On the other hand, you could do the reverse. If the knee wall offers enough height to hang close comfortably, just hang them within that space. 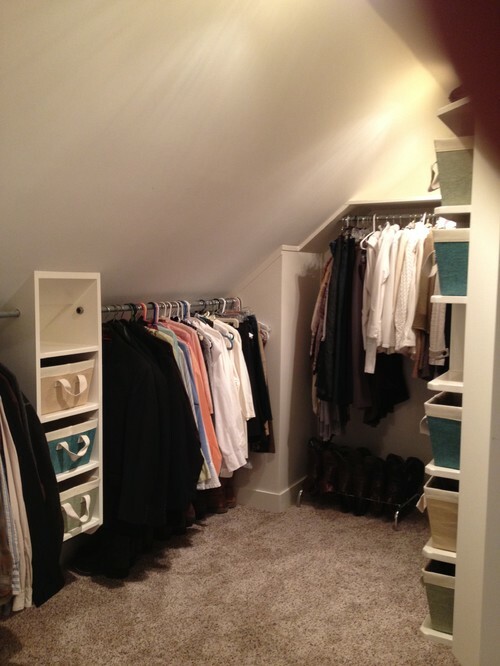 Then, along the sloped ceiling you could add storage space for shoes or other small items. You could also forego the shelving if you prefer to just install the rods. However, this would probably only work well if you have other means of storage for all of those items that require shelves or drawers. Above, they have placed shelving along one wall that offers ceiling height, and used the remaining space as hanging storage. 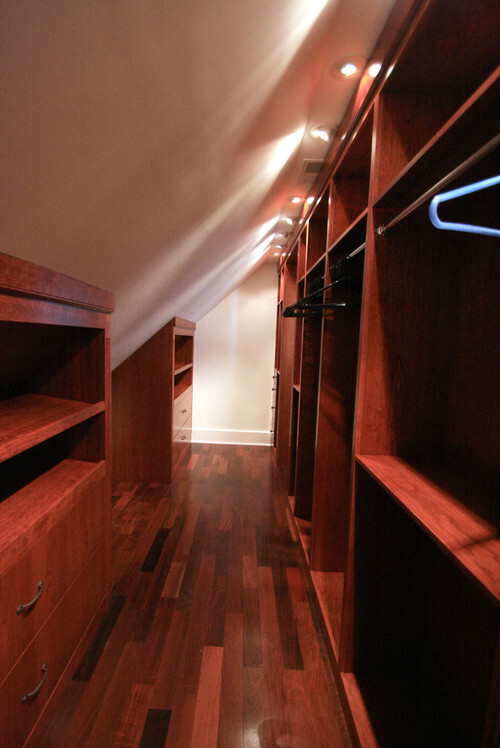 Likewise, you could add a header and some sliding doors along the sloped ceiling to create a closet space. Above, the header has been trimmed out and crown molding added to give it that final finishing touch. This image above has got to be one of the smallest bedrooms that I have seen. It also has utilized every inch of available space quite efficiently. From this view, you are looking across the headboard towards the foot of the bed. ( Yes, they have placed the bed backwards) The room is actually open to the main living space. So, the headboard serves as a knee wall for this space, and provides privacy for the sleeper. The closet has been built sideways to block the view from the end as well. 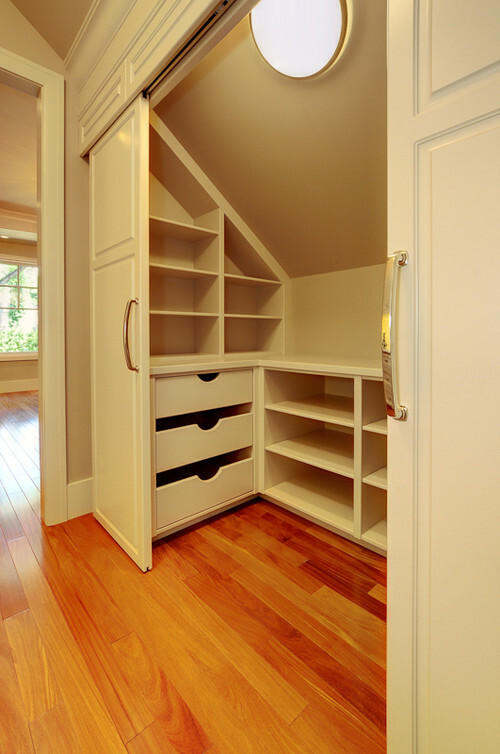 Not only is this a neat little closet, but it is also a great idea for creating a bedroom where once there was none. If you have a very small closet, it may work better to turn things sideways. 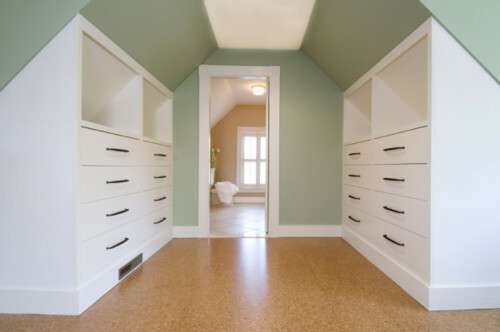 When the ceiling slopes towards the back of the closet space, you can generally create more usable space by installing along the side walls. If you are creating closet space for a small person, keep in mind that you really don’t have to place the rod at the traditional height. You can always lower it to just fit the users needs. This will free up some space for other types of storage. Also, when going sideways, consider recessing additional storage into the knee wall space. You should be able to just fit a nice shoe cubby into that area, or use this space to store books, purses, etc. As I mentioned before, sometimes you need to add closet space to a large room. In which case you can afford to sacrifice some space. In this bonus room, the ceiling sloped on both sides at the entranceway (just before the bump outs for the windows). So, this provided a nice place to create furniture like storage. Something like this could also be designed with doors to hide hanging rods, if needed. 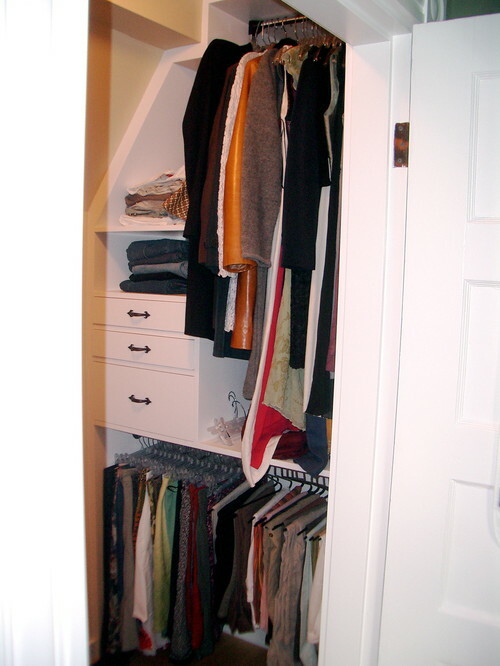 Here is another example of utilizing large niches to create closet space. 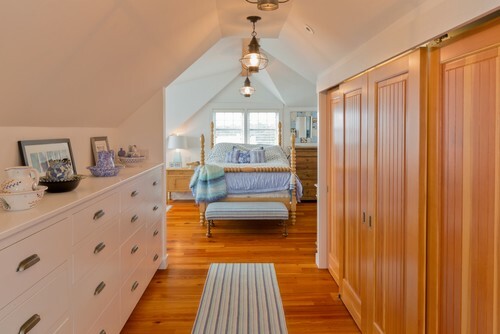 This once attic space makes a very nice bedroom. The big plus is that built ins always enhance the looks and the value of a home. 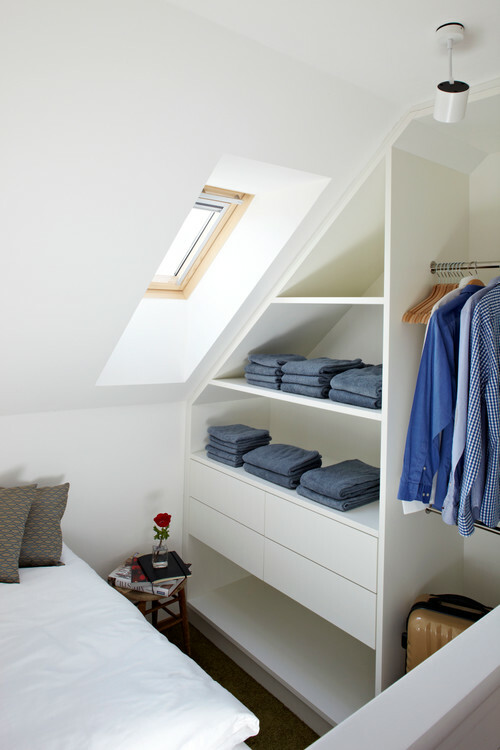 If you have an extra bedroom that you would like to use as a closet, consider whether you will want to be able to change it back in the event of a resale. For a quick room conversion (such as this previous bedroom turned closet), just add metal tracks along the knee walls. This allows for design changes without the extra expense. Plus, if you do decide to sale your home, these can be removed will very little damage, and you are back to a bedroom once again. FYI: This also works well for young couples who plan to have future children, but want some extra storage space while they wait. I have a very small sloped celing closet in my bedroom. It is only accessible via a small door. I was wondering if you have any ideas for that type of closet. All the ones show that they are walk in types, what about ones that you can’t walkin like that. Yes, in your situation I would suggest converting the space into a pullout. Anytime you have a small space that is difficult to access, it is better to bring the space out to you. In the past, I have built cabinet boxes/frames and attached them to the door in the same manner as any other pullout. You will need heavy duty, full extension glides to accomplish this. If you have some basic cabinet making skills, you should be able to do it. If not, any good woodworker should be able to construct what you need. (check out some of the closet pullouts on Pinterest for ideas).